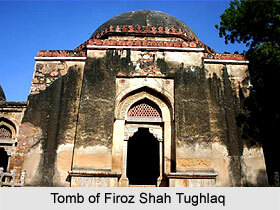 Firoz Tughlaq is very famous for his administrative reforms in the history of early medieval period. At the time of coronation of Firoz Tughlaq the economic condition of India was very deplorable. People were hard pressed due to heavy taxation. Failures of the Utopian schemes of Muhammad Tughlaq also made his situation grave. People had to suffer a lot due to plundering, maladministration and famines. Firoz enhanced the scope of Jaziya and even Brahmans were not exempted from it during his region. He also imposed irrigation tax on the peasants with the approval of the Ulema. Those who used water from the state canals for irrigation, had to pay 1\10 of their produce as irrigation tax. He also adopted measures for the improvement of the quality of cultivation and for better crops and thus helped the peasants. Firoz planted 1200 fruit gardens in order to enhance the income of the sultanate. Firoz tried to safeguard the interests of peasants. He increased the salaries of his officials and granted Jagirs to them so that they might not oppress the peasants. As a result of the liberal policy of Firoz the prices of various and fell quiet low and the people took a sigh of relief as they got ride of the tortures and the treatment of the previous rulers. In spite of various merits in the revenue policy of firoz, there were three defects which told upon popularity. (1) Firoz gave the work of revenue collection to the highest bid who harassed people. They collected more and deposited less in the royal treasury. (2) Jagirdari system was another defect in Firoz’s revenue policy predecessors, Alauddin Khalji and Muhammad Tughlaq Stopped practice but it was extended further by Firoz. (3) Imposition of Jaziya and Extension of its scope was also a great defect in the revenue policy of Firoz. It added to the unpopularity to the sultan. His enhanced revenue was due to (a) improved quality of cultivation and superior crops, (b) water tax, and (c) gardens. Firoz was very fond of gardens. He laid out 1200 fruit gardens in the neighborhood of Delhi which yielded an annual revenue of one lakh and eighty thousand tankas and enabled him to solve the problem of food shortage. Sultan Firoz Tughlaq took some effective steps in the sphere irrigation for the improvement of agriculture. He constructed five canals for this purpose. The first was the Sutlej to Ghanghar. Its length was about miles. The second carried water from Yamuna to Hissar. Its length was one hundred fifty miles. The Third started from the neighborhood of Mahanadi and Sirmaur hills and connected it with Hansi. The fourth ran from Ghanghar to Firozabad. The Fifth carried the water from Yamuna to Firozabad. Firoz was a great builder. He exerted himself for the well-being of his subjects. Sir Wolseley, Augustus. He paid great attention to the uplift of the poor and the downtrodden as his religious and moral duty. He has written in his autobiography, Futuhat-i-Firozshahi. He founded many significant cities of which Fateahbad, Hissar, Firozepur and Jaunpur are very famous. Firoz Shah Kotla near the red fort in Delhi was the favourite city of Firoz where he lived for a long time. Sometimes jobs were created to help the unemployed. One thing is to be note here that only the Muslims could be benefited by his charitable works as he was a fanatic sultan. Sultan Firoz also opened a magnificent free (charitable) hospital in Delhi called Darul Shafa for the use of all sick persons. Qualified physicians were appointed here for the treatment of patient’s free of charge. Free food was also given to the poor patients. As Firoza Tughlaq was a staunch Muslim ruler, his administrative justice was based on Islamic laws. He appointed a Quazi in the capital and as many supporting Quazi in the provinces. Muftis were also appointed to assist Quazi.